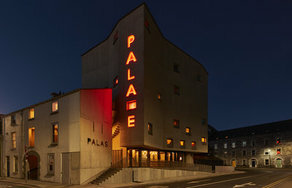 Pálás cinema in Galway city has been awarded the Use of Colour Prize in Amsterdam at the World Architecture Awards this weekend. Pálás occupies the site of a former 1820s merchant’s house and designed by award-winning architect Tom dePaor. Pálás is a soaring, seven-storey monolith comprising of a three-screen independent cinema and ground floor restaurant and bar, Merrow. Set right in the heart of the atmospheric Latin Quarter, a stone’s throw from Spanish Arch and the banks of the Claddagh River. "I am pleased that the building has won this award, from such an international field in such a prestigious festival. It was an honour to receive it from Sir Peter Cook, chair of the jury on behalf of Lelia Doolan, who took part in the presentations and Element Pictures .It is great for Galway to have this acknowledgement of its magic lantern." "This a very happy moment — to have Tom dePaor’s beautiful work recognised by an international jury of architects. They were captivated by his integration of light and colour in the building, and especially by the designs for the glorious windows, based on Pat Scott’s work and created by Tom and by Pat’s partner, Eric Pearce. Galway must be proud to have such a grand new civic place that is internationally recognised. As for us citizen volunteers in Solas Galway Picture Palace who had the idea and just kept going, it Is nice to share a medal after the marathon. " On winning the award Pálás and Element “are delighted about the world architecture award for use of colour. We are pleased for Tom dePaor, the design team and Lelia Doolan along with all her colleagues on the recognition of their vision. This award is fantastic news for the city of Galway."